More photos to follow of this gorgeous wedding when they come in! Jacqui had a custom made Primrose with bespoke sleeves and a train, great fun working on this dress and tweaking a dresses design making it the brides own unique style. Well the wedding was yesterday and the dress was absolutely AMAZING I felt a million dollars and Ian and every one of my guests were totally blown away. Our photographer took loads of pictures and i will send some over when he has done his bit but ive attached photos taken by guests so you can see. A big congratulations to Nicola and Jeremy who wed in August 2017! I hope you're well? I just wanted to email to say a huge thank you for the Sybil dress I wore to my wedding last month. It was such a fun dress and I felt amazing in it! You asked to see a sneaky pic, so I have attached one of both me and my husband Jeremy! "I loved the dress and loved wearing it. Everyone appeared in awe of the dress too, and I had tons of compliments and interest. I would guess more than for a typical dress! I really enjoyed having something that was unusual (no-one had expected it), easy to wear, fun, elegant and yet felt like me. I am inclined to think that it looks even better in real life than when photo graphed. Its superb when actually close up and one can see all the detail, textures, lighting etc. "I first contacted Vicky in November about the beautiful Primrose dress. I was a little worried about getting a dress from so far away (I live in NYC), but the style was exactly what I was looking for so I decided to go for it. Vicky was very helpful throughout the entire process. We spoke on Skype first, and then she sent me a detailed measuring chart. In March I received the dress and went for a fitting in NY. I was so happy to see that the alterations were going to be very minimal. I sent the dress back, and received it all ready to go a few weeks later. A dress is one of the most important parts of the wedding, and I can't thank Vicky enough for making this entire process so easy and pleasant, not to mention for creating such a beautiful piece of art! I can't wait to wear it next month, and show the dress off. ﻿Initially Erin and I did all everything remotely, but then when I had her dress ready she was able to combine a visit to the UK with her dress fitting. We did the fitting and then went out for the day, ate cake, drank coffee and put the world to rights! It was a typically drizzly welsh day, hopefully Erin will be back someday and we'll do the same again on a sunny day! That's the plan!! Erin said "Thank you SO MUCH for creating a beautiful dress. I love it. So did everyone else. I've been telling people left and right how awesome you are"
﻿﻿﻿Aimee and I's consultation took place entirely remotely and was turned around in 5 weeks (last minute order), she ordered a butterfly top in aqua, tulle skirt, camisole top and beaded belt.Love the boho look she's got here! Rachael was a private bride of mine and wore a made-to-measure Petra, a custom matching veil and headpiece I fashioned from a beautiful vintage necklace. She looks absolutely dazzling in this dress and it was such a pleasure working with her! I received a lovely email from Jonny Barratt Photography sharing these gorgeous photos of Casey and Jake's wedding. Casey struck gold by buying a sample Greta dress which fit her like a glove. Jake captured some stunning photo's and really showed how much fun this wedding must have been to attend! This is obviously down to his relaxed unobtrusive style of photography. Alice and Dan-HD 720p from Razia Naqvi-Jukes on Vimeo. This is such a beautiful wedding and I really encourage you to look at the video if you haven't already. Church ceremony, short walk then where everyone boarded a boat on the river Thames with a jazz band, after that the guests were taken on a red bus to the Ashmolean museum. During the run up to Alice's wedding I liaised with her father who had that stunning bracelet made for her which has very special sentimental value. It's mirroring the beadwork on her dress! I'm so lucky doing what I do for a living, I meet the most wonderful women and become part of one of the most memorable days of their lives and get to hear about how their wedding plans are progressing, I love it. Ali and I hit it off from the moment she arrived with her Mum to try on my collection. She already knew she wanted Evelyn and when she tried it on it was definitely the one....but then I made her try on a few other dresses and before we knew it she had to try everything on twice! It was a giggle, but its good to be sure. I was so please to see these gorgeous images taken on her day, she totally rocked Evelyn. Ali Glitterball! "Our wedding took place October 2015, in Dublin. I was recommended the Little White Dress bridal shop by a friend and on viewing their website decided that your designs were exactly what I was looking for as I didn't want the traditional bridal look. Evelyn was the one and only dress I tried on and loved it. You have a wonderful talent and all the best with future designs." Sabrina and Simon wed at the end of July 2015 in Warwick Castle, she made such a beautiful bride. A delight to work with, she also had a wicked sense of humour that I warmed to instantly, when Sabrina arrived for her consultation it was like a whirlwind of laughter had arrived at my studio. She wore not 1 but 2 of my dresses, a custom made Rebecca with a drop waist and a Evelyn gown for the evening. The details of this wedding are so beautiful, I hope to share more on those soon with you....but this will have to do for now. Sinead & Hu married in Ireland at the end of May, I think you'll all agree that Sinead is an absolutely beautiful bride. I met her in my stockist 'Little White Dress' at a trunk show and did a consultation there, she chose Cleo then I returned to Wales and the fittings etc were taken care of by the wonderful team there in Dublin, Janet, Amanda & Sarah (such a beautiful shop and the team there are so lovely). Sineads Wedding was featured on LoveMyDress, to read more about her big day click here. Can you tell me a little about where you got married & the ceremony. "Michael and I married on the South Island of New Zealand at The alpine village of Aoraki / Mount Cook, located in Aoraki / Mount Cook National Park . The reason why we choose New Zealand was because of the magnificent range of the Southern Alps; At 3,724 metres, New Zealand's highest mountain, Aoraki / Mount Cook is dazzling, and there are 27 other mountains in this alpine backbone which peak at over 3,050 metres, and hundreds of others not far short of that all making up the famous Southern Alps. The ceremony was held on the Liebig Dome which sits on the edge of Aoraki Mt Cook National Park and enjoys breath taking views of New Zealand's highest peak Aoraki Mount Cook and the Murchison Glacier at 7600ft. This was a unique opportunity to have our wedding ceremony and photographs taken amongst the magnificent scenery of the Southern Alps whilst enjoying the absolute stillness and solitude of our surroundings. The ceremony was shared with very close family and friends; both my Daughters and Niece were bridesmaids. " If you could sum up the style of your wedding in a few words, what would it be? "In a few words the style of our wedding was one with nature in a relaxed, informal environment surrounded by mountains , and open to all of natures elements and timeless beauty and embrace all that nature has to offer and to enjoy the peace and tranquility of our surroundings." 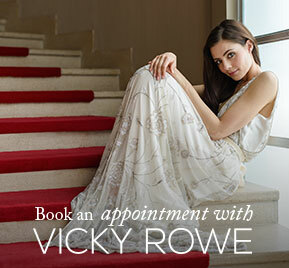 Why a Vicky Rowe Dress? "I choose a Vicky Rowe dress because of the timeless elegant design and simplicity of the dresses; they didn't have stiff bodices or look like traditional wedding dresses of today which i wanted to steer away from . I love the fashion of the 1920s; the intricate beading and the detailed patterns and cut of the dresses which have a silky and flowing elegance of simplicity and after months of research I found the perfect designer and my perfect dress. "The overall personal experience of meeting the designer and having an opportunity of a personal consultation and fitting from start to finish was wonderful, fun, without anguish and it beat going into a wedding boutique and buying off the rail so thank you Vicky for everything it made my wedding day extra special." "My dress will be worn again very shortly for a very close friends wedding anniversary in July; all the ladies are invited to wear their wedding dresses!!!!! so perfect for me. I couldn't imagine not wearing my dress again and because it is very different to a traditional wedding gown i can easily get away with wearing my dress at a Summer Ball or other event. Michelle wore an Amber Primrose. "The Rebecca was the first and only wedding dress I tried on. As soon as I saw it online I fell in love with it, and as soon as I tried it on I knew it was "The One". It was perfect, the vintage feel and the stunning embellishments, was exactly what I had always hoped for and imagined, as I really wanted something a little different from the "norm". I had so many wonderful compliments on the day, and since photographs have been on Facebook I have had enquiries from friends and friends of friends who are planning their wedding, asking me where I got my dress from.